In 2016, some of us were chaperoning teenagers on a long bus trip when the conversation turned to poverty, homelessness, and how it affects women. Once home from our trip, we learned that feminine hygiene products are among the least donated items to area homeless shelters and pantries. Shocked that such basic items are rarely available to women and girls in need, we recruited some friends and vowed to make a difference within our own community. She Supply is a 501(c)(3) that is unapologetically female. We are led by an all-women board of directors. Our name is strong, discreet, and dignified. Just like the women we serve. She Supply’s mission is to provide feminine hygiene pads, bras, and underwear to our community partners on an ongoing, consistent basis. Lifting that burden from these agencies allows them to spend their valuable dollars on their other programs and services. 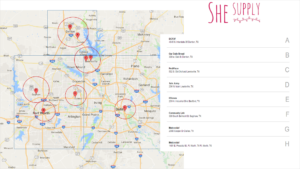 She Supply is based in Flower Mound, Texas, and provides donations to our community partners in the Dallas-Ft. Worth Metroplex. Monetary donations via PayPal on our website. ALL monetary donations are used to purchase feminine products and undergarments for our community partners. Please contact us at shesupply@gmail.com to arrange pick up of your donations. Make a Monetary donation via PayPal on our website. ALL monetary donations are used to purchase feminine products and undergarments for our community partners. Shop on AmazonSmile. The AmazonSmile Foundation will donate 0.5% of the purchase price of eligible products to the charitable organization of your choice. Choose She Supply as your charity of choice here. Buy something from our Amazon Wish List. See our list here. Donate products such as feminine hygiene pads, tampons, bras, or underwear (new in packaging or with tags). Please contact us at shesupply@gmail.com to arrange pick up of your donations. Invite She Supply to speak at your organization’s next meeting to learn more about our mission. Please contact us at shesupply@gmail.com to schedule a speaker. Host a Donation Drive– We’ll help you organize a She Supply donation drive for your business, community organization, or church group. Just set a time frame for your donation drive, advertise your donation drive to your group, set up collection boxes, and feel good knowing that you’re all making a difference for women and girls in need. This is perfect for individuals or groups who need service hours or a service project. Request Product Donations for She Supply in lieu of gifts at your graduation party or for your birthday or anniversary. Host a Provision Party – Invite your friends, family, co-workers, neighbors, bible study group, etc. to come to your She Supply Provision Party. You supply the food and beverages and your guests bring product donations for She Supply. We’ll supply you with the plastic bags and Kindness Cards that you and your guests can use to package your feminine hygiene donations into period packs for us to distribute to women and girls in need. Please contact us at shesupply@gmail.com for more details and for help in planning your project.